In this Photoshop Effects tutorial, we're going to look at another movie poster-type of effect. 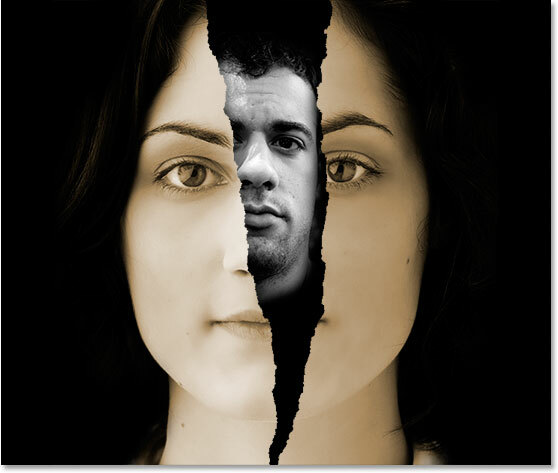 We're going to learn how to create the illusion that a piece of a photo is torn away to reveal another photo underneath it. I saw this effect used in a poster for a tv show on the FX Network, and when I realized how easy it would be to do something similar in Photoshop, well, here we are. To create the effect, we'll be colorizing one photo and converting the second one to black and white, then adding some noise, enhancing shadows and highlights, and using a few layer masks to blend it all together. 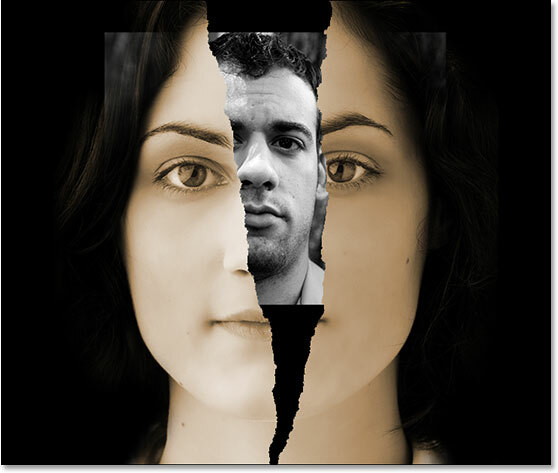 Drag out a selection with the Crop Tool. The image is now cropped. 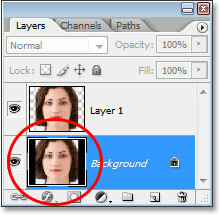 Click on the Background layer in the Layers palette to select it. We're going to add more canvas space to the left and right of the image, and we're going to use the Crop Tool to do it. But first, press the letter D on your keyboard to quickly reset your Foreground and Background colors if needed, so black becomes your Foreground color (white becomes your Background color), and then press X on your keyboard to swap them, so black becomes your Background color. Select the Crop Tool once again. Then with the Background layer selected in the Layers palette, drag out a selection with the Crop Tool around the entire image. Hold down "Alt" (Win) / "Option" (Mac) to drag out either of the side handles to add more canvas space. The canvas space now added on the sides and filled with black. 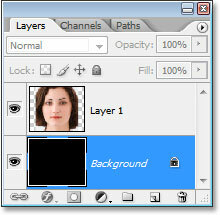 The Background layer's thumbnail in the Layers palette still shows the original image. Only the extra space on the sides has been filled with black. The Background layer's thumbnail now shows the entire layer filled with black. 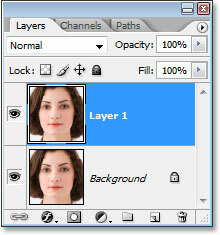 Step 5: Add A Layer Mask On "Layer 1"
A layer mask thumbnail has now been added to "Layer 1" in the Layers palette. The layer mask itself, rather then the contents of the layer, is now selected, and we know that by the white highlight border around the layer mask thumbnail. We want to paint with black, so press X on your keyboard to swap your Foreground and Background colors again, which makes black your Foreground color. Then, with a large soft-edge brush, paint along the edges of the photo to blend them in with the background. Because we're painting on the layer mask, not the actual layer, anywhere we paint with black will hide the image. It looks like we're painting directly on the image itself because we're painting with black and the background is black, but if the background was a different color, you'd see that we're really just hiding the image as we paint on the layer mask. You can change the size of your brush with the left and right bracket keys on your keyboard (the left bracket key makes the brush smaller and the right one makes it larger), and to make sure your brush has a soft edge, hold down your Shift key and press the left bracket key a few times (pressing the right bracket key while holding Shift makes the brush harder). Then paint around the edges to blend them in with the black background. 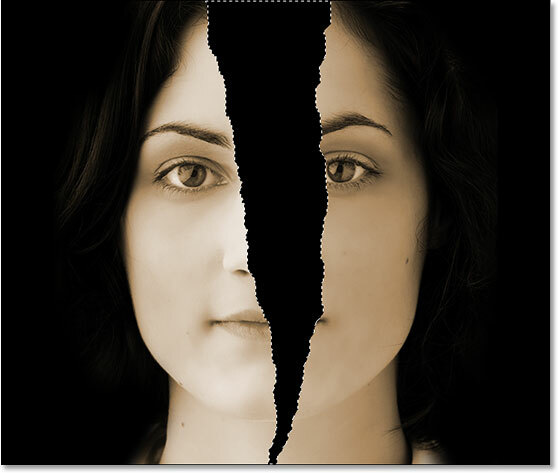 The image after painting around the edges with black to blend them in with the background. By holding down Alt/Option. this tells Photoshop to bring up the New Layer dialog box before adding the adjustment layer. 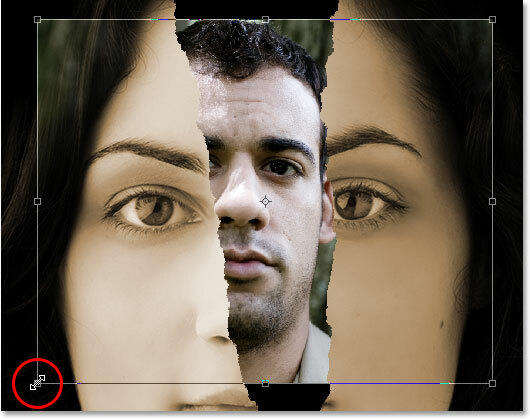 Click inside the checkbox to the left of the Use Previous Layer to Create Clipping Mask option to select it. By selecting this option, the Hue/Saturation adjustment layer is going to affect only the layer directly below it ("Layer 1") and will have no effect on any other layers. This isn't so important at the moment, but it will be once we drag our second photo into the image. 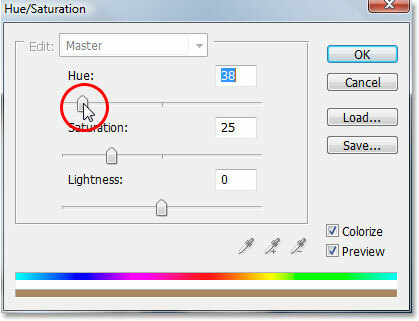 Click OK to exit out of the dialog box, and the "Hue/Saturation" dialog box will appear. 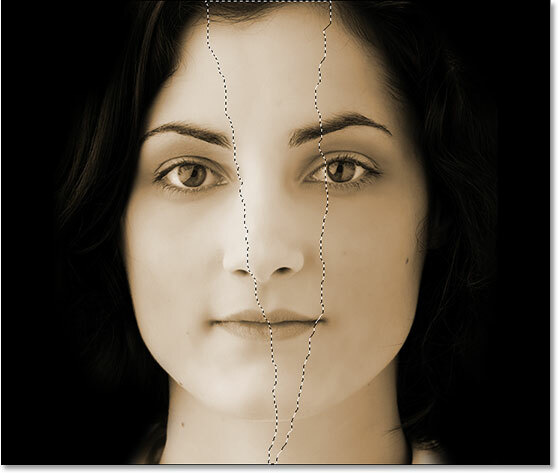 Drag the "Hue" slider to set the color you want to colorize your image with, keeping an eye on your image as you drag. The image after colorizing it with the Hue/Saturation adjustment layer. Right now the woman's face looks a little too bright for the effect we're going for. Let's add some dramatic lighting to her face, using a Curves adjustment layer and the layer mask it comes with. 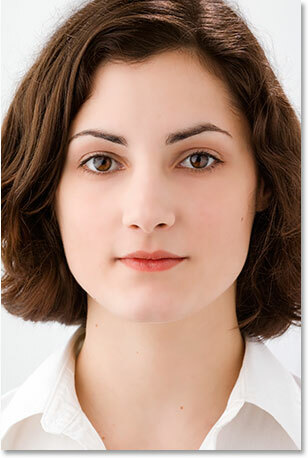 Don't worry if you've never used Curves before or if it seems too advanced for your current Photoshop skill level. All I'm going to do is add the adjustment layer. I'm not going to actually do anything with it, other than change its blend mode, which I'll do in a moment. First, I need to add it though, and I want to add it between "Layer 1" and my Hue/Saturation adjustment layer, so I'm going to click on "Layer 1" in the Layers palette to select it. 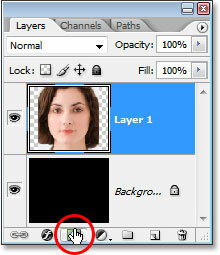 Click on "Layer 1" to select it, then click the "New Adjustment Layer" icon once again. 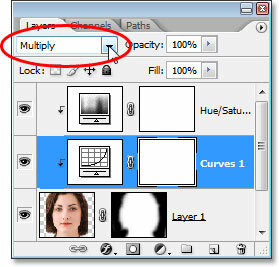 Select the "Curves" adjustment layer. Change the blend mode of the Curves adjustment layer from "Normal" to "Multiply" to darken the image. The image after adding a Curves adjustment layer above it set to the "Multiply" blend mode. 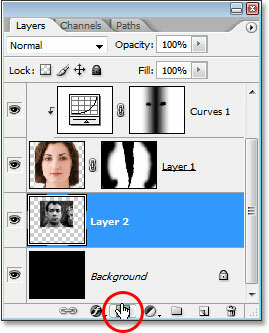 Make sure the "Foreground to Background" (black to white) gradient is selected in the Options Bar, and click on the "Reflected Gradient" option. The lighting is now more dramatic on her face. Painting with black over her eyes to bring back the original brightness. The image after restoring the brightness in the woman's eyes. 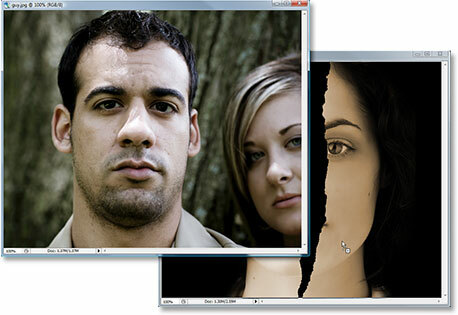 Photoshop Effects: Drag a seletion through the image which will become the area that is "torn out" of it. 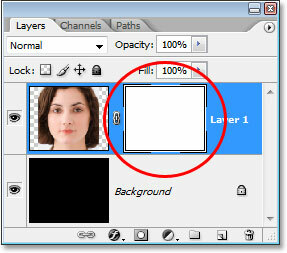 Click the layer mask thumbnail on "Layer 1" to select the layer mask. After filling the selection with black on the layer mask, the area inside the selection is now hidden from view, revealing the black background behind it. Press Ctrl+D (Win) / Command+D (Mac) to clear the selection. The image after applying the "Spatter" filter to enhance the torn edges effect. 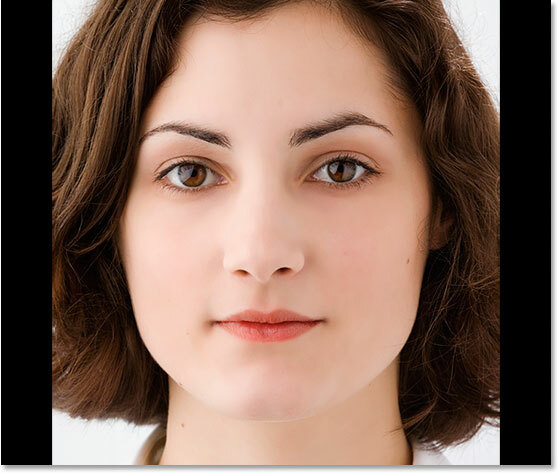 Photoshop Effects: Click inside the second photo and drag it into the main document. 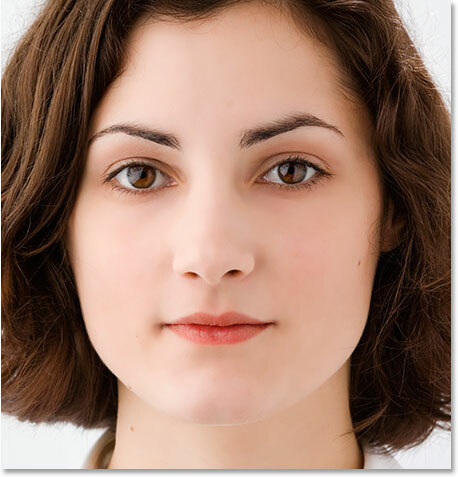 Close out of the second image's document window after you've dragged it into the main document. The second image is now on its own layer, named "Layer 2", between the Background layer and "Layer 1". 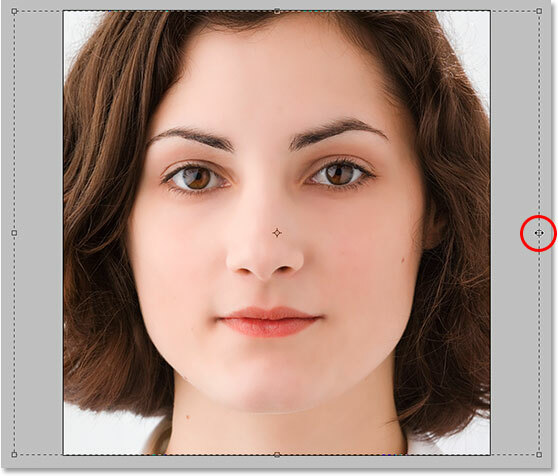 Move and resize the second image as needed with the Free Transform command. When you're happy with the size and position of your image, press Enter (Win) / Return (Mac) to accept it. The layer mask now added to "Layer 2". Select the Brush Tool once again, and with black still as your Foreground color, use a large soft-edge brush and paint around the edges of the second image to hide them, just as we did with the main image. The image after painting away everything except the area around the guy's face in the second image. 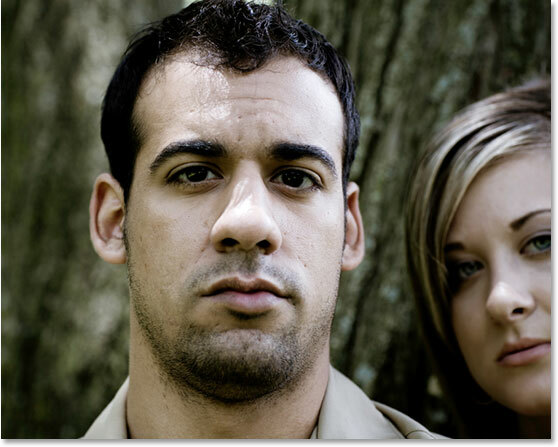 Creating a shadow with the Brush Tool along the left side of the guy's face. The shadow along the left side of the guy's face adds some depth to the image. 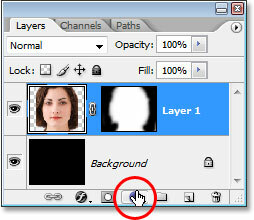 Add a new layer at the top of the Layers palette. Add some noise to the image with the "Add Noise" filter. Change the blend mode of the noise layer to "Color Burn" and lower the opacity to about 30%. 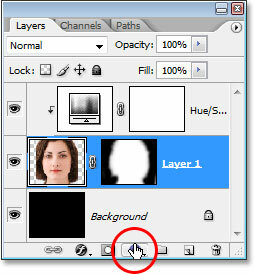 Step 18: Add Another New Layer And Set Its Blend Mode To "Overlay"
Click on the "New Layer" icon once again, then set the blend mode of the new layer to "Overlay". 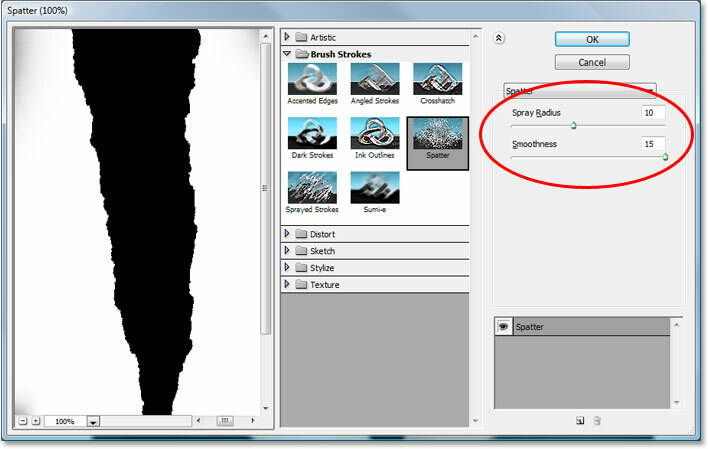 Lower the opacity of the brush down to about 20% in the Options Bar. Use a soft-edge brush set to black to darken shadows in the image. Paint over any areas with white to enhance highlights. And there we have it! 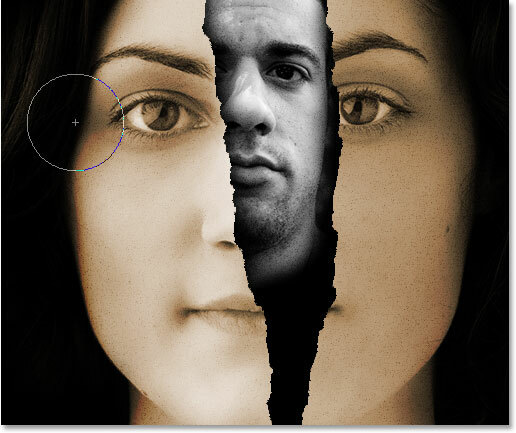 That's how to tear away part of a photo to reveal another beneath it in Photoshop! 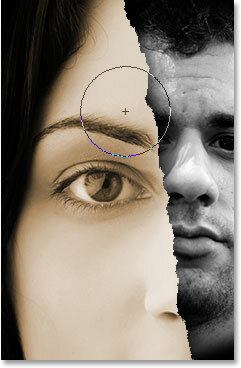 Check out our Photo Effects section for more Photoshop effects tutorials!